Easter is a widely-celebrated holiday in France, but not only for religious purposes. Boulangeries, chocolateries and pâtisseries everywhere bring out some of their best work for this holiday, crafting some truly wonderful sweets during the days leading up to Holy Week, which is from March 29th to April 4th, and ending on Easter Sunday, April 5th, 2015. 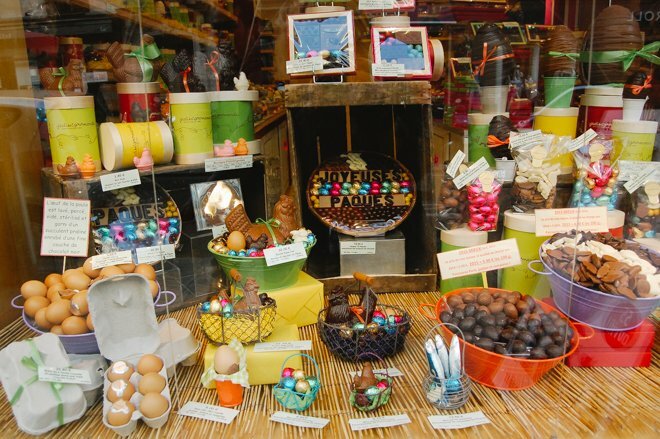 We took a walk through Saint-Germain-des-Prés in the 6th arrondissement to find some of the most beautiful, quirky, adorable, magnificent and most importantly delicious Easter creations! 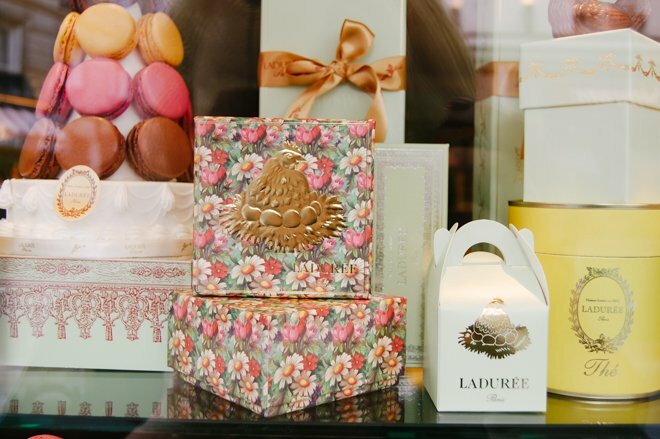 First up, one of everybody’s favories: Ladurée. 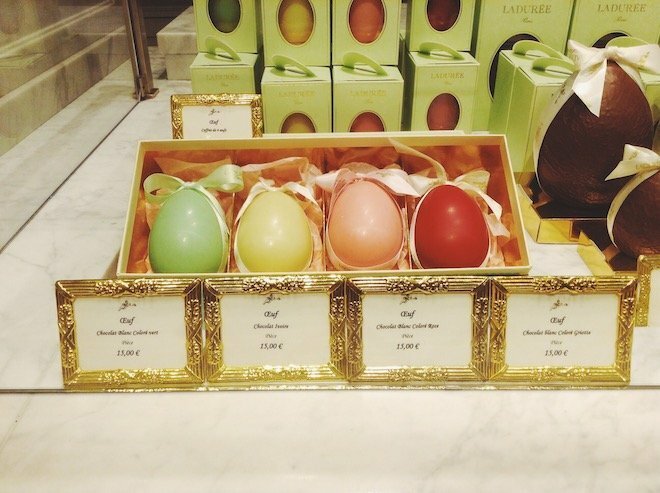 Known primary for their pastel-colored macarons and ornate packaging, Ladurée also make some lovely Easter treats. We spotted chocolate eggs wrapped in silky ribbons of pink, gold and mint green, as well as colorful eggs made from white chocolate. 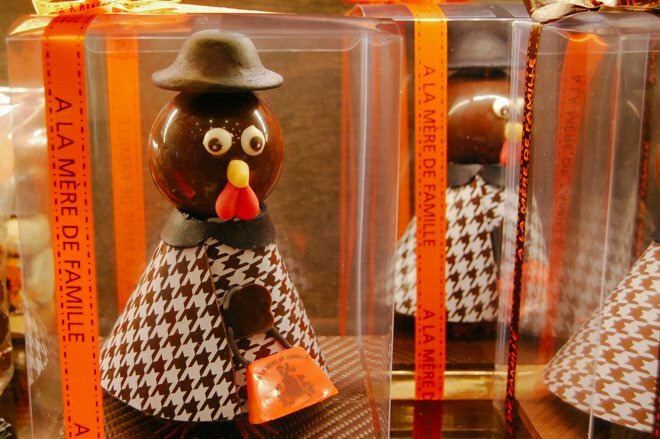 They also have cute hens made of chocolate, and their spring packaging is to die for! Just a short walk down Rue Bonaparte, you’ll find another highly popular pâtisserie, Pierre Hermé. 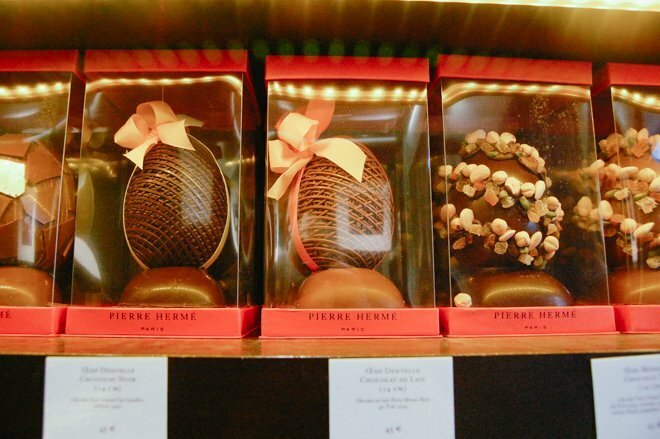 This Easter, they’re offering some slightly more elaborate chocolate eggs in various sizes, some even larger than a basketball! With patterns, textures and toppings, these eggs feel more sophisticated sitting on their chocolate pedestals. 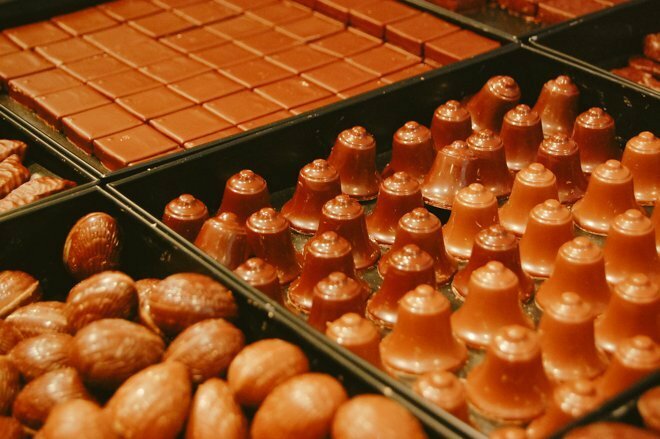 Just next door to Pierre Hermé you’ll find a more traditional chocolaterie with a family-run, friendly kind of atmosphere: À la Mère de Famille. This boutique, founded in 1761, is covered floor-to-ceiling with Easter-themed chocolate figurines. Some common motifs during Easter are: eggs, hens, fish and most importantly, bells. 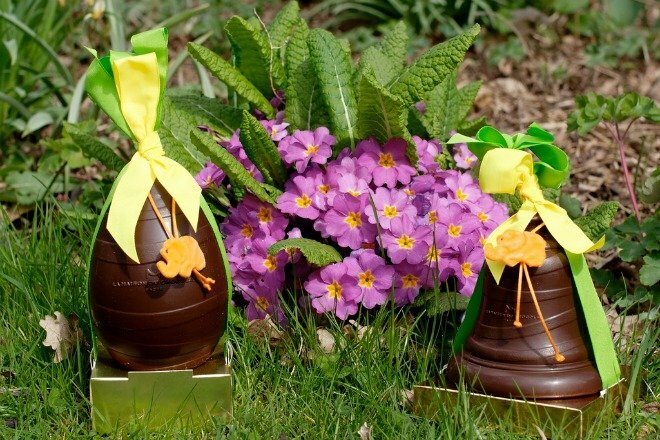 In France, instead of an Easter bunny, there is an Easter bell who brings children their candy, although the bunny has become more popular in recent years. 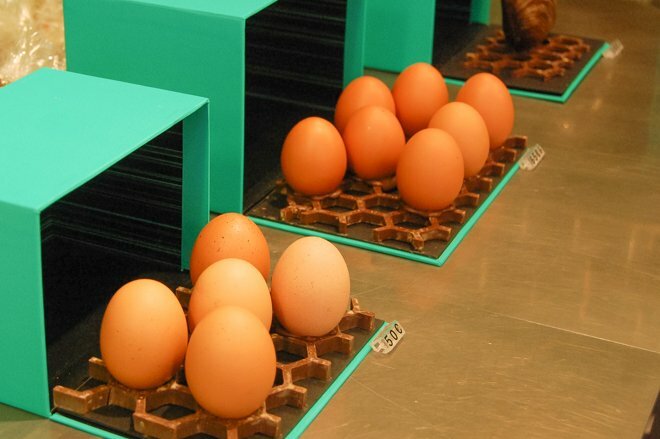 You can read more about French Easter traditions and the different symbols here. À la Mère de Famille had some of the most beautiful and charming pieces. From ornate bells to comical chickens with personality, and even simple chocolate eggs wrapped in colorful foil. 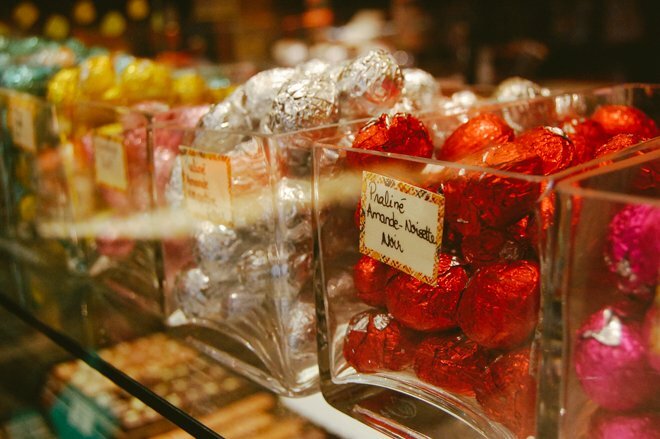 This is a chocolaterie you won’t want to miss. 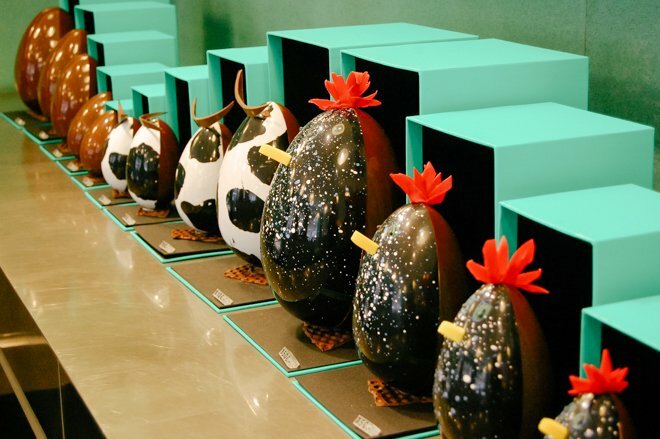 For a more contemporary, quirky approach to Easter chocolates, visit the boutique of chocolate artist Patrick Roger on shopping thoroughfare Rue de Rennes. You’ll find abstract eggs representing chickens and cows, sculptural hens with crazy “hair,” and simple bells and fish. Their trompe l’oeil eggs are so realistic, down to the texture and tiny brown freckles! The attention to detail here is certainly not lost. You can find wonderful Easter-themed goodies in neighborhood shops as well, the one below has a bit of everything! 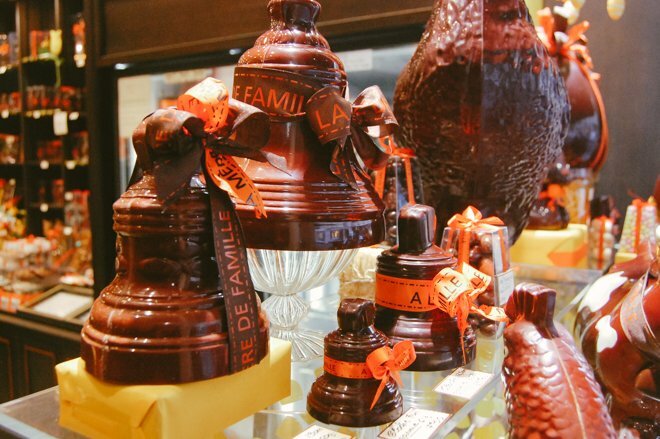 If you find yourself in Paris during Easter, you must take some time to admire the beautiful creations that chocolate artisans make this time of year. If you’re coming from North American Easter traditions, which have become so commercialized with plastic eggs and mass-produced chocolate, it’s refreshing to see products steeped in culture and tradition. That’s part of the beauty of France, the pride and commitment to tradition. PREVIOUS: Don’t Be the “Poisson d’Avril” this April Fools’ Day! Posted on Thursday, April 2nd, 2015 at 5:01 pm in Food & Drink. You can follow any responses to this entry through the RSS 2.0 feed. You can leave a response, or trackback from your own site. 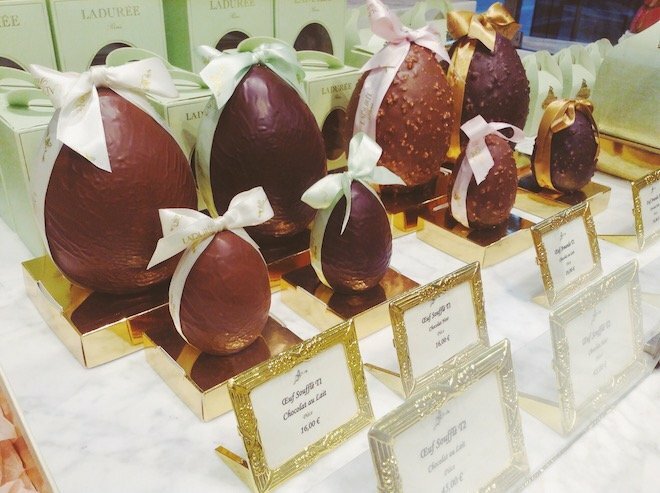 Easter Chocolate in Paris – Charming, Playful & Delicious! 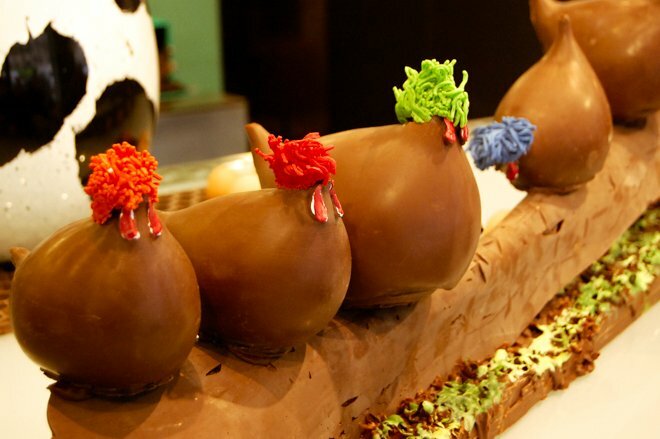 Discover the Easter Traditions in France Christmas at our Favorite Paris Pâtisseries Happy Easter from Paris!